Warm and Toasty! - "So, I've been thinking..."
Home cocktails Warm and Toasty! I don’t know about you…but I am freezing! It is so cold in CT right now and there is more snow in the forecast. It doesn’t feel like this winter will ever end. And speaking of toast…will you be watching the Academy Awards on Sunday? Will you be raising a glass with the celebrities (or is it just me who behaves as if I’m hanging with some of my best friends who just happen to be famous and wealthy and accomplished – laughing at all the inside jokes, tearing up when they mention their moms, wishing I could be a seat filler in the seat next to George Clooney or Sandra Bullock or Jared Leto)? No, I haven’t had a drink already – I just happen to love the Oscars, it’s my favorite reality TV show. And if you’ve seen Dallas Buyers Club you probably want to sit next to Jared, too. Whether you want to get warm and toasty because it’s so darn cold or you are looking for a celebratory cocktail or both…I’ve got the drink for you. Now, before you say, “I don’t like peach” or “is that like peach schnapps, because I got sick on that in high school/college/at my cousin’s wedding and I haven’t been able to drink it since” please trust me when I say that Ciroc Peach is in no way similar to peach schnapps except for the fact that they celebrate the same fruit. This vodka is light, not syrup-y or super sweet. This cocktail is perfect for a celebration or for any time you just want something different. In fact, with a splash of oj, this is my beach vacation drink every summer in coastal North Carolina – and I am indeed Warm and Toasty when I have it. I’m showing Veuve Clicquot as the champagne here because I was gifted a bottle but you can (and should since you are mixing it) use a less expensive champagne or prosecco – Mionetto makes some fabulous proseccos (with their orange label on the bottle) or under the “il” (yes i-l, it’s in cursive on the bottle) brand, each is probably $11 – $15. The link is so you can see what the il bottle looks like, you must be 21 to view the site. Now I want to know…do you watch the Academy Awards? Do you have a cocktail when you watch – and if so, which one? What are you doing to stay Warm and Toasty this cold, snowy, never-ending winter? I’d love to hear it because I’m running out of ideas! I do happen to love the peach flavor, so this one sounds like one I would enjoy. I love that you labeled this to keep us warm and toasty, because here in NY it is just as cold and more snow on Monday. Seriously, will it ever end!! I feel like this winter has just been one big freezing snowstorm – I need something, anything to keep me warm! Ohh..I love peach flavor and it reminds me of late summer. I’m so cold that I turned on the fireplace and the oil heat, and I rarely do both. The kids are both sick – we can’t have this zero degree crap! I know! Worst winter ever! Woke this AM to frozen pipes – again! I need a little summer right now!! Yummy! Thanks for sharing via #LOBS! So glad you stopped to try it! That was fun! MMMM, a peach coacktail sounds delicious. My go-to dessert-in-a-glass drink is Bailey’s on the rocks. YUM! Mix some into hot cocoa and I’m toasty warm. That sounds delicious! Have you ever tried a little kahlua and peppermint (schnapps or white creme de menthe?) in your hot chocolate? Think Thin Mints. Probably good with Baileys in there too! Do you know…I started a cocktail board on Pinterest because of YOU? 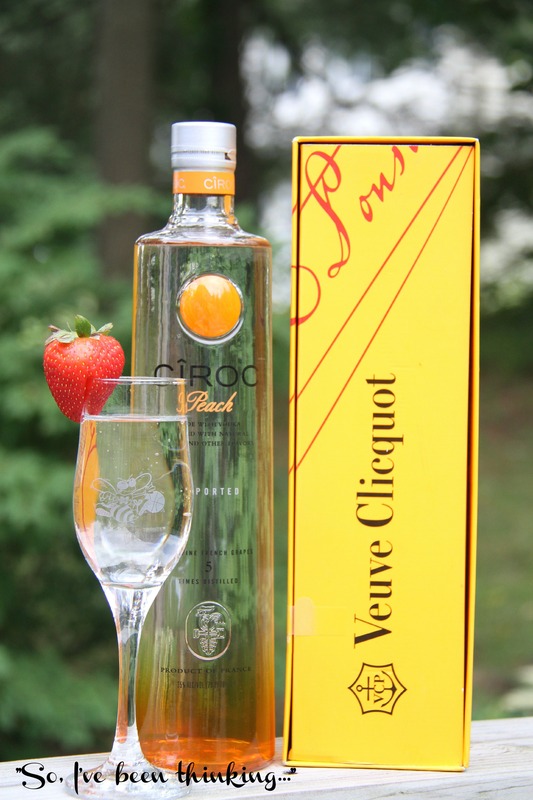 I can’t wait to try this one – and thank you for the reassurance that Peach ciroc is nothing like Schnapps! I love hearing that! And I look forward to keeping you in ideas for delicious cocktails! You wouldn’t believe the number of people you keep company with regarding peach schnapps. It’s very funny – it must be a starter drink for many. If you do get to try this, you’ll see, you feel pretty sophisticated…not at all like a crazy college kid. I read this earlier but am just now getting over to comment. I would never think to put a drink together like this (as you know) but you have never steered me wrong. So I am sure I would love this! I know, it’s so simple but not obvious. I mix a lot of things with prosecco and they are all delicious. I’ve got lots of posts ahead. This looks so good and perfect for brunch!! It is perfect for brunch. And lunch. And dinner. And…you get the idea. I did watch the Oscars, but no drink in hand. I never would have lasted until midnight! I did get to sleep in on Monday because we had yet another snow day. Tuesday too – ugh! This drink looks delicious, Stephanie. I like vodka and prosecco, and peach. Heading to the beach this summer – guess what I’ll be bringing? Weren’t they brutally long? I DVR’d it, went to bed planning to watch the rest in the AM, but my DVR shut off at 3 hours so then I had to hunt it down to watch the last half hour, eventually through on-demand, which you can’t fast forward. I should have had several of these drinks and just stayed up. Hope you enjoy the drink as much as I do. Perfect for the beach and snow days! I don’t drink but man does this look and sound delicious!